Ernesto Valverde's side currently have a healthy five-point gap over Atletico Madrid at the top of La Liga, and a Champions League last-16 date with Lyon to forward to in February. Last week, Barcelona renewed their interest in Chelsea winger Willian, proposing a deal which would see Malcom move to Stamford Bridge, according to Sky sources. Barca saw three summer bids - the last of which being £55m - rejected by Chelsea before signing Malcom instead for £38m from Bordeaux. Malcom has struggled for game-time at the Nou Camp, but Chelsea head coach Maurizio Sarri is not entertaining the prospect of swapping Willian for the 21-year-old. 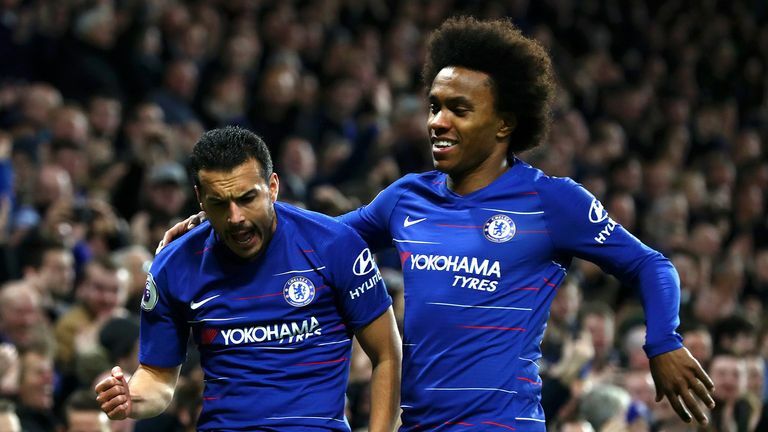 "As you know, Willian for us is very important," Sarri said. "I think he can do better, he can do better because of his potential but he is really very important to us, so I think it is impossible to lose him in January." Sarri duly started Willian in their next match following these comments, with the Brazilian going on to score the winner in the 2-1 victory over Newcastle. Ajax duo Mathijs de Ligt and Frenkie de Jong are attracting interest the continent over. De Ligt, 19, picked up the Golden Boy award last year, which is given to the most promising player under the age of 21 in Europe. Barca are reportedly interested in the central defender, though Juventus appear to be in pole position. Meanwhile, the race to sign 21-year-old De Jong is also intensifying. Paris Saint-Germain are closing in on a 70 million euros (£63m) move for the midfielder, according to Marca, though a fortnight ago SportBild in Germany claimed the player had agreed a five-year contract with Barcelona. Ajax face immense pressure to hold on to the Dutch duo, who will look to carry the nation into a new, more-promising era after failing to reach Euro 2016 and the 2018 World Cup. Lionel Messi (17 goals) and Luis Suarez (14) top the goalscoring charts in La Liga, but reports this January will tell you Valverde is seeking back-up following Munir El Haddadi's departure to Sevilla earlier this transfer window. This search has seen both Chelsea's Alvaro Morata and Tottenham's Fernando Llorente linked with Barca, while Morata's team-mate Olivier Giroud is the latest to be linked. Euro papers: Giroud off to Barca? According to Sport in Spain, Barca want a physical presence in attack, and it seems appropriate - albeit rather ironic - that Giroud is being targeted having initially moved to Chelsea last January for a similar reason. Chelsea were also linked with Llorente, as well as Peter Crouch, Andy Carroll, Edin Dzeko and Ashley Barnes, before landing on Giroud 12 months ago. There is no telling yet where Barca's pursuit could take them. Barcelona are facing stiff competition in the race to secure Adrien Rabiot's services from Paris Saint-Germain. The midfielder has six months left on his current contract at PSG, meaning he could leave the Parc des Princes on a free transfer at the end of the season. Sky in Italy reported last week that Rabiot had reached an agreement with Barcelona to move at the end of the season in a deal worth £9m a year, while Sky in Germany claim nothing has been finalised, with the player's agent in negotiations with multiple clubs - one of which is Bayern Munich.